2013 Dresses | Palmer's | Steal This Dress! Palmer’s cocoa butter skin products are second to none, in this beauty addict’s opinion. It’s that good, you ask? Yes. So good that my friends and I would always stock up on Palmer’s during visits home before heading back to college overseas, where Palmer’s products were not available. I still squeal with delight every time I cover my lips in Palmer’s Lip Butter. It provides dry lips with instant relief in the form of a velvety-smooth ointment that has a hint of shine to it. What else do I love about it? For someone who is so sick of the artificial strawberry scent so common in today’s lip treatments, it’s refreshing to finally see some ‘grown-up’ flavors–Dark Chocolate & Peppermint and Dark Chocolate & Cherry. 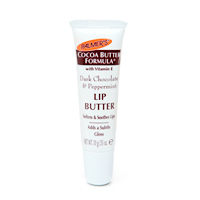 Palmer’s Lip Butter is probably the most budget-friendly product StealThisDress! has reviewed yet. At $1.99, it truly deserves a rating of 5 luscious lips!